Hey everyone, it’s Wednesday so we are rocking the Shop Shots today. I don’t really have much more to say, so lets get into the pictures! What you are looking at here is a deceptive little trick. 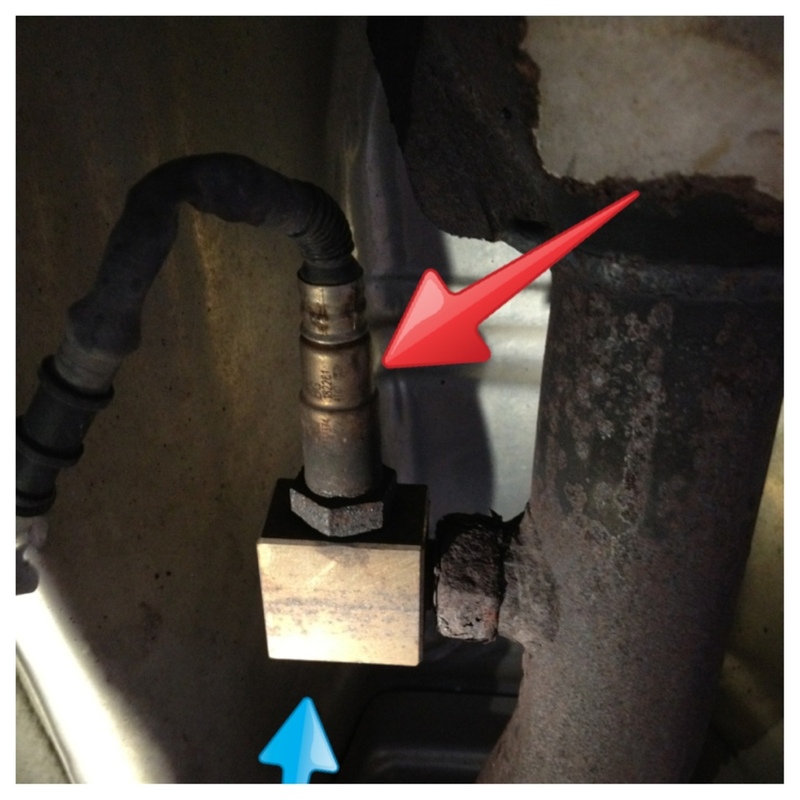 This is a picture of an Oxygen sensor(red arrow). That sensor monitors the efficiency of the catalytic converter. The box that is installed in the pipe(blue arrow) is NOT a factory part. This is a trick that people use to fool the ECM. When a catalytic converter fails, it will turn on the MIL. To bypass the MIL people will install this box or some other device that pulls the O2 sensor further out of the exhaust. This makes the ECM think that everything is working properly. Sadly, it just means the car still fails a state inspection. A lot of tuners do this to there car. They remove the cat, and install one of these. Hey, it is cheaper than replacing a cat right? High Pressure Fuel Pump, must also be properly timed. There is so much happening in the belt circuit. 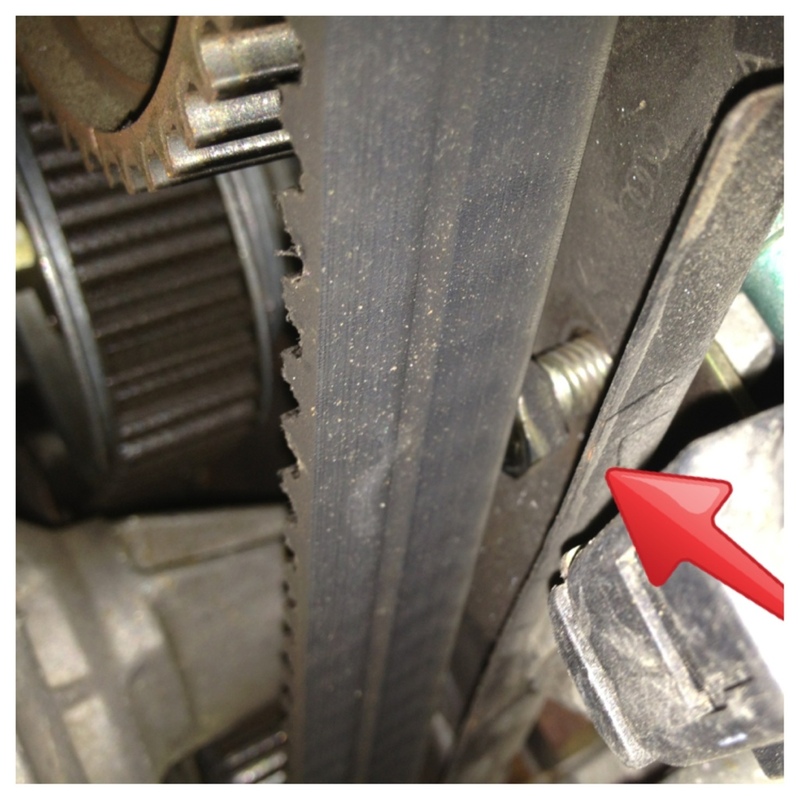 This is why, unless you are really handy, I recommend leaving timing belt jobs to the pros. This picture is courtesy of the luckiest customer of the day. I pulled this car in to do a 100,000 mile service. That is like a mini tune-up, with a full list of inspections that we do. 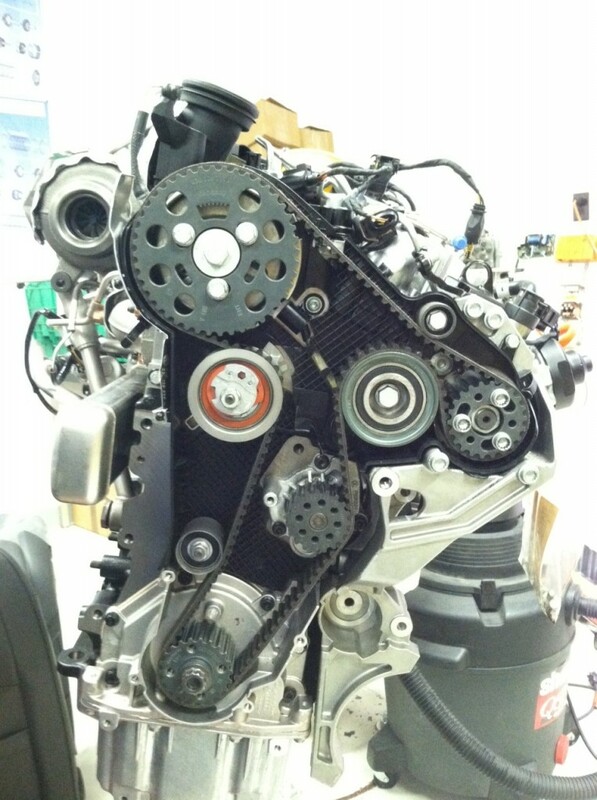 As part of the service, I checked the timing belt. When I pulled the cover back, I noticed that the belt was replaced. I started to put the cover back on, but found that something was not right. I took the cover all the way off, and found this bolt was not tight. This bolt holds a cover on. Lots of techs will remove the cover when they replace the water pump. I prefer just to move the shield a little and not touch that bolt. If for some crazy reason I need to remove the bolt, I make sure it gets some thread lock before I install it. I put my magnet on the bolt, and it just came right off. There were no threads holding the bolt on. This customer was one good bump away from that bolt falling into the timing belt. I have seen engines destroyed for that exact thing happening. It not only will shred the belt, but punch holes in the bottom end of the engine. When we told the customer what had happened, they were thankful. I don’t think they really understood how close to disaster they really were. Lucky Lucky Lucky! Well, that raps up another round of automotive service pictures, more commonly known as Shop Shots! Don’t forget to chime in with your thoughts. On this or any post really. The more you guys add, the better we can make the posts. Also, I am still looking for other folks in the auto industry for Behind The Wrench. If you know someone that would be awesome, just contact me! Love to see the shop shots commented by you. You do have a gift.